Hongkong Sun Rise Trading of China is recalling about 60,200 cordless electric chainsaw sold in the U.S and Canada. The chain brake guard can fail and allow the chainsaw to continue operating, posing an injury hazard to users. This recall involves Greenworks, Kobalt and Snapper brands of cordless electric chainsaws with a 16 or 18-inch saw and an 80 or 82-volt lithium ion battery. 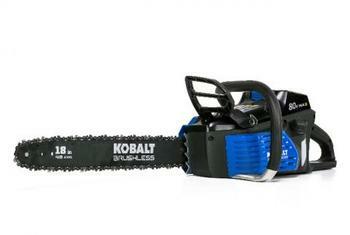 “GreenworksPro,” “Greenworks Commercial,” “Kobalt,” or “Snapper” is printed on the saw blade. The model number and item number (if applicable) are printed at the top of the warning label underneath the chainsaw switch handle. The chainsaws, manufactured in China, were sold at Lowe’s and other stores nationwide and online at Amazon.com, Lowes.com and other websites from January 2015, through October 2017, for between $170 and $300. Consumers may contact Hongkong Sun Rise Trading toll-free at 888-266-7096 from 9 a.m. to 8 p.m. (ET) Monday through Thursday and 9 a.m. to 5 p.m. (ET) Friday through Sunday or online at www.greenworkstools.com and click on “Important Safety Notice” at the bottom of the page for more information.